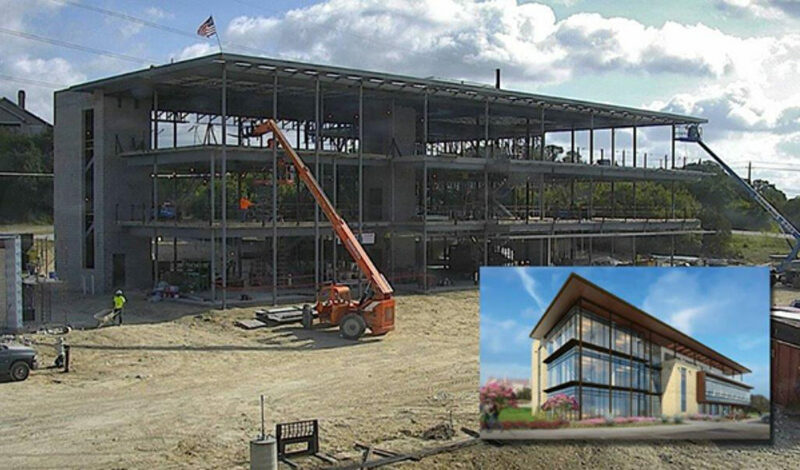 AUSTIN, TX -- Construction on the American Association of Nurse Practitioners (AANP) new national headquarters in Austin reached a milestone Monday when the 33,943-square-foot structure was topped out at a ceremony attended by AANP staff, White Construction Company crew and building designer, Studio8 Architects. The building represents the continued commitment AANP has to the Austin community, home of the organization since its founding in 1985, and further solidifies Austins and Texas position on the map of Americas changing health care landscape, said AANP President Joyce Knestrick, PhD, C-FNP, APRN, FAANP. Located at 5901 Vega Avenue in southwest Austin, Travis County, on a 4.199-acre tract of land, the three-story 33,943-square-foot building will be a professional office space that will be mostly owner-occupied by AANP. The first floor of the building will have space for tenants. This glass, stone and stucco structure will include surface parking for 134 vehicles. Completion is slated for spring of 2019.